Diwali (Indian festival of lights) is coming up and bloggers are busy posting all the delightful treats on their blogs and Indian stores are crowded with people doing last minute shopping for sweets, clay lamps and groceries. The stores advertise grocery items on sale and there is usually a big crowd in the Indian store where I get my Indian groceries. So going there on Diwali season during my lunch time from work is a risk, since I won't be able to return on time even though the store is close by. So I rely on homemade sweets during Diwali. Trust me, they tastes much better than the store bought sweets. 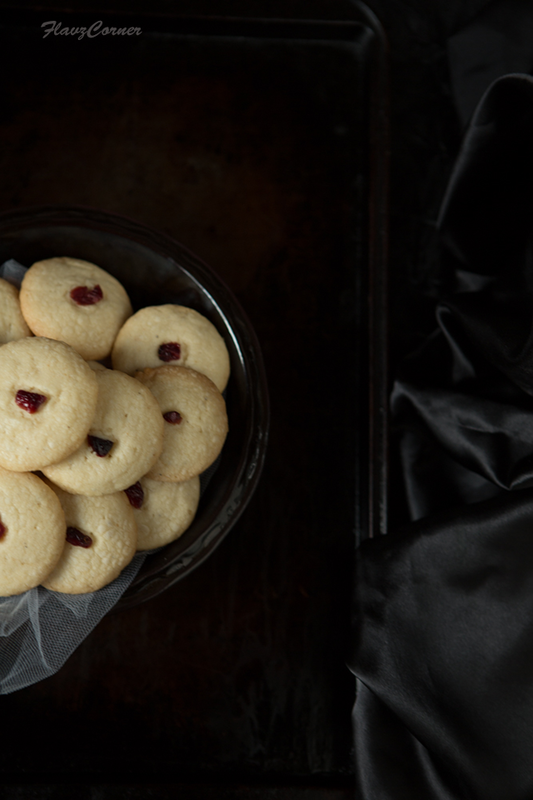 For this Diwali, we are indulging on this melt in mouth Cardamom Butter Cookies aka 'Nan Khatai'. Like I said, it’s like a piece of white cloud that will melt in your mouth. 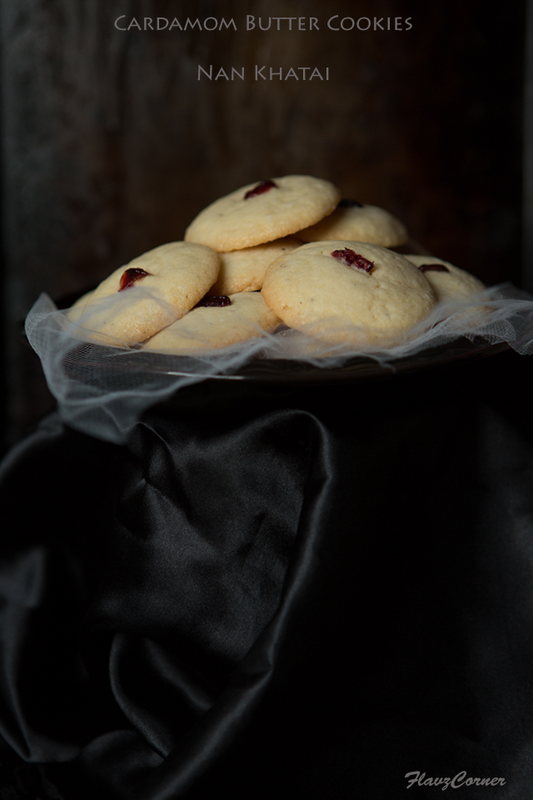 The texture is close to short bread cookies, but it is very delicate and the touch of cardamom uplifts the whole butter cookie to another level. There are several variations to this recipe, but here I used the simple ingredients to make this yummy treat and I topped it with a piece of cranberry to give an appealing contrasting look. If you have never tried making these treats, I insist that you should give this a try. You will definitely enjoy this treat!! Pre heat oven to 300°F. 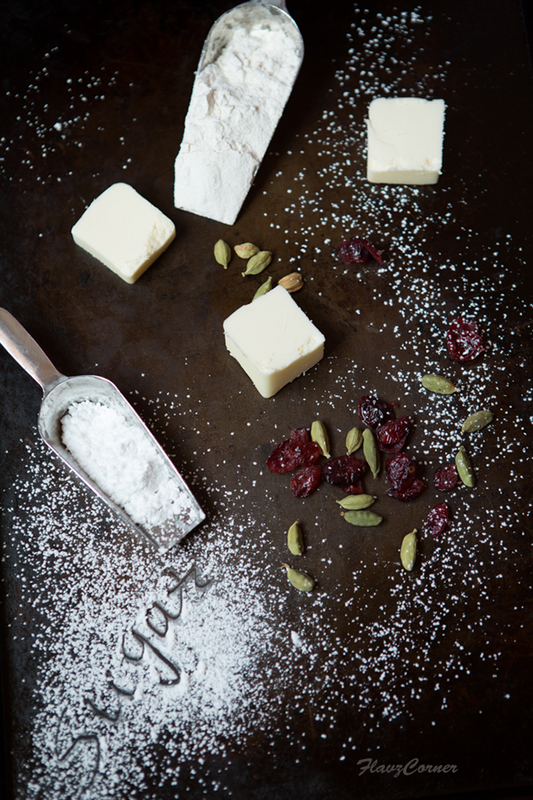 Combine powdered sugar and butter in a mixing bowl till creamy using a rubber spatula or a wooden spoon. Sift all purpose flour, salt and baking powder into the creamed butter. Using your hand knead it to a soft dough. Wrap the dough in plastic wrap and refrigerate for 15 - 20 minutes. Line a baking sheet with parchment paper. Take roughly 1 table spoon of the dough of each cookie and roll into smooth ball, press the ball slightly between your palms and press a piece of cranberry on top of it. Bake for 22-25 minutes on the middle rack. The cookie should be still white in color. Cool the cookies on wire rack and store in air tight container. You can get green cardamoms from Indian stores or online . The seeds inside the pods should be powdered and used for flavoring. It has a strong flavor. Adjust the amount per your taste. Make sure to cream the butter and sugar well, so that there are no lump of butter left, which can deflate the cookies. The mix should not be runny. If the dough is not rolled into smooth balls, cracks will appear on the cookie while baking. If the dough seems to be sticky, don't panic, cover it with a plastic wrap and plop it into the refrigerator for 15-20 minutes so that it hardens a bit and is easy to work with. Melt in the mouth cloud - loved that description. Haven't tried these cookies yet, will definitely make them! I too loved the description melt in the mouth cloud :)love homemade cookies anytime and ur idea of black mountain and clouds on top. This is the first time I got some grocery on sale. Hope they are not pushing old stock. Shibi I wanted to ask u how long do u keep food in cast iron pan after cooking. I left some thoran in it for half a day and by night I finished it but it left me uneasy with an after taste all night. Thank you so much for replying so prompting Shibi, will keep those tips in mind. I never leave any dishes in the cooking pan (any type). I always transfer the dishes to either porcelain (corningware) or glass containers which makes it easier to put it in the refrigerator. Leaving the curries or dishes in the cast iron pan can cause an after taste of iron. So the rule of thumb is transfer the dishes right away to a non reactive container like glass. Let the cast iron cool. Clean it with hot water and a brush. This way the pan won't get stained with the turmeric and the spices we use. If you feel that the stain is not going, use some all purpose flour or rice flour to clean the pan, it removes the stain. After washing, I dry it with a towel and keep it in the oven (off) to air dry little more. If the pan looks less shiny, I apply little oil using a paper towel. This helps to remove the iron taste and keep it non-stick. Once you feel like the glaze of the cast iron pan is eroding, then season it according to the directions given on the sticker you got with the pan. I have noticed that when seasoning is gone, the food starts to taste iron too, so its important to keep the cast iron pan seasoned well. These butter cookies look scrumptious. I love the use of cardamom. Fun pictures! Particularly like the "sugar" one. ;-) And a really nice recipe -- we should make these. Thanks. I had tough time choosing between Nan katai and Kaju katli for taking it to work for Diwali, but i went for Kaju katli..if I saw ur pics perhaps I could have gone for this or would have taken both..I will make it next year for sure..looks so yumm and tempting !